Presented by Chris Smith, Hannah Critchlow. A self-powering retinal implant that can turn light into sight has been successfully tested in rats. The device, the brain child of scientists at Stanford University led by Yossi Mandel, is intended to treat disorders caused by the loss from the eye of the rods and cones that convert light waves into electrical signals that the brain can understand. Critically, in these conditions, the underlying retinal tissue, including the cells that give rise to the optic nerves that convey the sight-information to the brain, remain intact. So artificial implants can feed electrical signals into these cells, which respond just as if the rods and cones were still working normally. But existing retinal implant prototypes have a number of problems, not least that they needed an external power supply, and running wires across the retina can lead to abberant signals being fed into the wrong cells, reducing the quality of the resulting image. The solution offered by the Stanford team, published in Nature Communications, is to use a self-powering device that obtains the energy it needs from the light that lands on it. 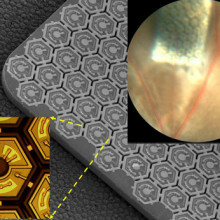 It comprises a series of miniature photovoltaic cells that react to incoming light waves by producing small electrical currents that are then fed directly into the underlying retina. Using rats with degenerative retinal disease as well as normal healthy animals, the researchers successfully tested versions of their implants containing arrays of up to 186 photovoltaic cells - or pixels - in the animals. The devices were placed inside the eye directly onto the retina where the rods and cones would normally reside. Then, spots of near-infrared (NIR) light, to which the implants are designed to respond, were beamed into the eye. 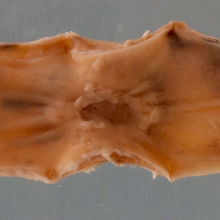 When the implants were illuminated, the electrical activity of the visual areas of the animals' brains correspondingly altered, indicating that the implant was registering the near-infrared light and correctly stimulating the retinal circuitry. The implants also faithfully reproduced flashes of light, which were presented at rates varying from twice to twenty times per second, producing similar brain responses to a healthy retina, and the system worked for at least 6 months following implantation. It's early days yet, but the thin dimension and relative simplicity of the Stanford groups prosthesis, and the fact that it can be scaled up to make larger arrays of light-detecting pixels, means that it could be used to produce a viable device for human trials relatively soon. The disadvantage is that the present design relies upon near-infrared light, which would need to be beamed into the eye using a miniature projector coupled to a camera and mounted, most probably, on a pair of glasses or a visor. 04:53 - Is alcohol safe during pregnancy? Is a glass of wine a day too much during pregnancy? The balloons are made of layers of polythene 15 meters wide and 12 meters high - and are filled with helium so they can float into position. Each balloon will ascend to an altitude of 20 km, to a layer of the atmosphere known as the stratosphere. At that height, you'd need a pair of binoculars to see them in the sky. At this altitude, weather balloons usually end up bursting, since the helium inside them expands as they rise. However, the multiple layers of plastic in Google's balloons are designed to stop them from popping. Anyone who wants to use the network will need to attach an antenna to their home - this will send a signal to the nearest balloon. The data will then be relayed from balloon to balloon before being sent back to a ground station on earth. 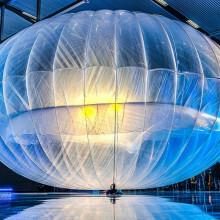 Each balloon can provide internet access over distances of up to 40km, and because they are so high up, buildings and hills won't create signal black spots. The system will aim to deliver data at a similar speed to 3G networks already used by mobile phones - but might eventually be even faster. The balloons carry solar panels, which will provide all of the power needed to keep the on-board radio antennas and electronics running. The balloons will not be tethered and will float around naturally in the stratosphere. However the team will be able to direct the balloons to move up and down, which they hope will allow them to switch between layers of wind which move in different directions and at different speeds. By using the wind to blow the balloons around in this way, they hope to be able to build automated computer systems which will keep the balloons in formation. Over time, currents like the jet stream will cause the balloons to drift over large distances - but the team hope that the balloons will eventually form a global network, and those serving South Africa may, for example, eventually serve South America and come around the globe again. Aspirin cuts down the rate at which cell DNA is damaged, explaining its anti-cancer effect, new research has revealed. It been known for some time, from observational studies and in particular a recent trial of bowel cancer patients looking at relapse rates, that aspirin and other NSAIDs (non-steroidal anti-inflammatory drugs) exert a strong anti-cancer effect in various organs including the lungs, oesophagus and intestines. But how this class of agent achieves this effect wasn't known. Scientists had speculated that inflammation can trigger cells to divide and, in the process, pick up cancer-causing damage to their DNA, but there was no direct evidence that this was happening. Now, University of California, San Francisco scientist Carlo Maley and his colleagues have used a group of patients undergoing monitoring for an oesophageal condition - some of whom started using NSAIDs during the study while others stopped using the agents - to track the rate at which the patient's cells acquired potentially cancer-causing DNA changes. Thirteen patients, all with a condition called Barrett's oesophagus - which is a risk factor for oesophageal cancer and requires regular monitoring, were studied over a 6-19 year period. Over 160 biopsies collected from the patients were examined to look for the rate at which DNA in their oesophageal cells was developing abnormalities. When the patients were not taking NSAIDs, the team found, their cells picked up changes or mutations at the rate of about 7.8 new abnormalities per year. On aspirin or a related NSAID, however, the rate was ten times smaller - just 0.6 abnormalities per year - in 11 of the 13 patients. This suggests, the team say in their PLoS Genetics paper, that "the pathway where NSAIDs exert their protective effect involves the reduction in the number of somatic germline [DNA] abnormalities..."
14:30 - How do we store memories? Scientists have created a new cool technology to peer into the living brain and see memories forming as little dots moving around! Chris - For the uninitiated, what actually is a fungus? Ali - Fungi are a very diverse group of organisms. There are over 1.5 million different species of fungi. They're split into roughly 5 different phyla, so 5 different groups and they do some amazing things for us and for our environment. But the basic structure of a fungal cell is actually fairly similar to a plant and animal cell. It has a membrane just like an animal cell does, and it has a cell wall just like a plant cell does. But the cell wall is composed chitin rather than cellulose, which of course a plant cell wall is composed of, and of course, fungi don't contain chloroplasts, so they can't photosynthesise. Chris - Does that mean they depend on plants then to get their energy? How do they survive? Ali - They're heterotrophic organisms. So basically, what they do is they break down dead organic matter. They are the world's best recyclers and what they do is they send out fine filaments of hyphae which group together to form the main body of a filamentous fungus that's the mycelium. And the mycelium ramifies through just about every habitat on this planet, producing extracellular enzymes which are released into the environment, around the mycelium and they're then used to obviously break down large organic molecules into smaller building blocks that can be used, not only by the fungus, but also by other organisms within the ecosystem. Chris - So, the fungus secretes this digestive juice, the goodies get taken up into the fungus and it then carts it off, grows more fungus but then also - I was reading, it almost then uses it to barter with other organisms to trade. Ali - That's right. One of the amazing things that fungi do is they form partnerships with plants. These partnerships are called mycorrhizas. There are several different types of mycorrhizas but probably, the two most dominant types are the ectomycorrhizas and they form between the basidiomycete group of fungi and trees and shrubs within the woodland habitat. We also have the AM mycorrhizae, the arbuscular mycorrhizae and they actually are a partnership between glomeromycota and up to 80% of plants species, mainly crop plants and horticultural plants. Basically, what happens with an AM mycorrhizal association is the fungus will actually penetrate the cells of the cortex of the root. And there's basically a trade-off. The fungus will send out its mycelial strands out into the environment and into areas where it can capture minerals like nitrogen and phosphorus and water, and translocate those back to the plants where they're taken up and used for plant growth. Chris - What does the plant pay for this valuable mineral? Ali - In return of course, the plant provides photosynthate, carbon compounds that it's made during photosynthesis. But it's really very interesting because plants can associate with many more than just one mycorrhizae. They can associate with a whole group of mycorrhizae. Similarly, mycorrhizas can build associations with a number of different plants and there's a trade-off. A plant will decide whether or not it's going to give a lot of carbon to its mycorrhizal partner and it's all dependent on how much phosphorus and nitrogen the mycorrhizal partner will give in return. In other words, it's sort of a two-way biological marketplace where both partners are contributing products and services, and both are rewarded for success. Chris - Do other signals potentially go through that network apart from just, "I give you some sugar. You give me back some phosphorus. That's very nice." What about if I'm sensing danger in my neck of the woods? Can I send a signal via you to Hannah to say, "Watch out!"? Ali - Absolutely. We found some very interesting things recently with common mycorrhizal networks and that is that if a plant that has a common mycorrhizal network is challenged by a pathogen then it can actually send info-chemical signals through the common mycorrhizal network to neighbouring plants. And this allows those plants to become primed for resistance. So, they build up a sort of immunity and it's a little bit like the innate immune system in animals. So, it becomes primed and ready, and able to defend itself, should it be challenged. Hannah - But are fungi always the good guys? Ali - Fungi do some amazing things for us and they make the world tick. But of course, they can be rotters. They do do bad things too. In fact, 70% of plant diseases are caused by fungi and a number of fungi also produce secondary metabolites that have toxic effects, particularly if humans consume the mushroom. Fungi are amazing organisms, and from experience they can be delicious too! 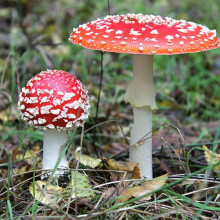 But some fungi also contain deadly toxins. Nicholas Evans, the author of the Horse Whisperer, is all too aware of this after he accidentally picked deadly webcap mushrooms on a foraging trip to the woods. Kate Lamble spoke to him about his experiences. Kate - Last time we met Nicholas, I was working on a TV book show and in order to get the interview, I remember that we had to arrange this mad dash on a motorbike across London. Nicholas - You remember that. Nicholas - It was terribly exciting. Kate - It was, but it was in order to get you to something a bit more serious, to dialysis. Thankfully, I hear you're better now, but can you tell me a bit about how you got so ill in the first place? Nicholas - My wife and I and our young son who was 6 years old at the time went to visit her relatives in Scotland and while we were there, we were told by somebody who lived there that there were some fabulous ceps and chanterelles growing in the woods. Nobody else seem to be interested in going, so I walked up the track and went into this wood and there they were, just two kinds of mushrooms growing there and I know chanterelles well from lots of times that I've been there before. The other mushrooms which were supposedly ceps looked a bit different from the ceps that I had picked probably about 12 years before with a friend here in Devon where I live. I thought, well maybe it's a variety that's slightly different from the ones that grow down south. So anyway, I picked them. We prepared them and I cooked them in a bit of butter and with the chanterelles, and some parsley which is what I would normally do. Thank God! The 4 children who were eating with us 4 adults had the good sense not to eat any of the mushrooms. They didn't taste terribly good actually. They tasted kind of earthy, but they were okay enough for both of the men, Alastair, Charlotte's brother and myself to have a second helping. Kate - How much did you know about mushrooms and mushroom picking beforehand because we've got quite a phobia of going out and do that in the UK at least? The mushrooms that we eat are quite limited. Did you feel comfortable enough to go out and sort of feel like you knew what you were doing when you were choosing the mushrooms? Nicholas - I've normally, ever since I was a kid, with my dad, picked field mushrooms. To be honest, I haven't through my life picked much that's exotic. I've cooked and eaten little tiny putballs which are fantastic, the occasional parasol mushroom, but most things, I wouldn't touch because I just would not feel confident of them. And even if I picked them, I'd come back and identify them, but I would throw them away. But on this occasion, it was a case of two people, each believing the other knew what he or she was doing. It turned out that the lady who told me that they were ceps had always called all brown mushrooms ceps. 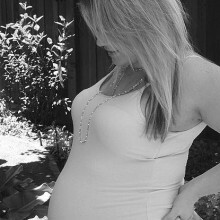 And when she told us that the next day when we were starting to vomit and have diarrhoea, we all kind of gasped a bit. Had it not had such tragic consequences, it would have been a really interesting case of passing the trust to somebody else; you just believe what the other person is saying and suspend your own natural sort of protective instincts. Kate - And that moment of trusting in somebody else's judgment, how quickly did you know that something wasn't right and that they weren't ceps? Nicholas - The next morning, Alastair started to feel sick and then as the day went on, my wife Charlotte started feeling odd and then by about mid-afternoon, I started feeling a little bit weird. And then it all started to develop very, very quickly and by the end of the next day, all four of us were in Elgin Hospital. Kate - How long did it take for the hospital to work out that it was the mushrooms? Nicholas - We had this family doctor came around and we knew pretty well actually what they were. I mean, we looked in the book the very next morning when Alastair started feeling ill and Charlotte was already ill. It was so clear from the photograph that what we had eaten, it wasn't a cep. It was themushroom called cortinarius speciosissimus which some people call the deadly webcap apparently. It had a rather comforting skull and cross bones underneath it, with a little caption, deadly poisonous. Kate - How did you react when you saw that? I imagine, I would have just been terrified. Nicholas - We knew something was going on obviously and there was a sort of mounting fear, but it wasn't like as a panic. We thought it would be sorted. We thought we'd just get like a severe case of food poisoning. We didn't know exactly what this mushroom does and unlike some other mushrooms which actually, in a sense I suppose are more dangerous because they attack all of your organs, often the liver, this cortinarius speciosissimus is very choosy. It just heads straight for the kidney and closes your kidney down, and we were being prepared for dialysis pretty much straight away. You stop peeing almost immediately or a couple of little drops. I didn't pee for 3 years after it actually untill I got a transplant. And just shocking sickness for the first week, I really wanted to die. We all did actually and it was only the thought of our little 6-year-old boy that really kept me and my wife alive. It would've been much better to surrender to it and go actually. Kate - As I say, the last time I saw you, you were on dialysis and that was quite a while after the initial incident. How long did you remain on dialysis and the problems went on for? Nicholas - I started taking a toll my heart, the dialysis puts your heart under tremendous pressure and that's when although my daughter Lauren had offered right from the start, as had all of my kids, even Finlay who was 10 years old by then and 9 years old and it was only when my heart was in trouble and my daughters said, "Dad, you really got to wake up. You're going to take my kidney." She said, "I'm not being wonderfully unselfish. I'm being really selfish. I just like you to be around when I have kids and get to meet them." And so, we did it and my life completely changed. I was just - I discovered about a month after the transplant what I used to feel like and then Charlotte had her transplant a year after mine and she is now wonderfully fit and well, and we are back to normal. Kate - What's your advice for anyone who goes out wild picking like you did? Nicholas - The advice which I have always followed except for this one isolated and absolutely catastrophic occasion is that you should never eat anything without checking first in a very good mushroom book. Mushrooms go through different phases as they grow, so it's important to have a picture and text on the various stages of growth. A mushroom that comes out of the ground looks often quite sort of closed in on itself and then it can spread and become something that looks almost altogether different. So, you have to be sure of what you're eating and if you don't, you're like we were, foolish. 39:01 - Why are mushrooms poisonous? 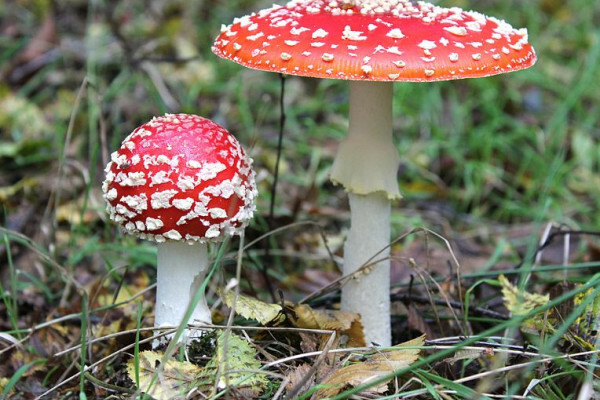 Tom Bruns explains why some mushrooms are poisonous and how one mushroom toxin is helping us understand RNA trsncription..
Nicholas Evans' experience of mushroom poisoning was devastating, but how do they produce these toxins and are they really targeted at us? Chris Smith spoke to Tom Bruns from the University of California, Berkeley who's an expert on fungal ecology and evolution. Chris - So, why do we think that fungi makes these toxins in the first place? Tom - Well, the quick answer is we don't really know, but the prevalent theory would be that they're making these to prevent them from being eaten by other organisms that would chew up their fruit bodies before they can sporulate. Exactly which organisms are being targeted isn't clear in most cases. Chris - It's an extraordinary case of overkill though, isn't it? If you listened to what Nick had to say, A.) It wasn't much of a deterrent and it happened much later, so it didn't really stop him destroying the fruiting body. So, humans presumably are not the target of these toxins. Tom - Probably not, because we're not the major selective force. With few exceptions, we're not scouring the woods and clearing out all the mushrooms. Certainly, in North America, deer would be a very common vertebrate that would eat mushrooms and they eat a lot of them. A toxin like this would probably have a very similar effect on them, I would think. Chris - Are there any animals that are invulnerable to the toxins? Can any animals eat these things with impunity? Tom - Certainly, there's a lot of insects, particularly fungus flies, beetles, and so on that chew up lots of different mushrooms, including some of the most deadly. So they seem to have some immunity to it, yes. Chris - And when they get inside the bodies of target organisms whether it's us, deer, rabbits, whatever, how do they actually tend to work? Do they all work in the same way as the one that Nick had? Tom - There's a huge number of mushroom toxins that all act in very, very different ways that aren't even related to each other. The one that he encountered here goes straight for the kidneys, but I don't believe it's actually known how it does that. It's been relatively recent years that this has been sorted out that it is this particular mushroom or group of them that have this kidney toxin. 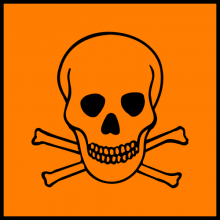 Chris - Once these toxins enter the body, is there any way that we can get rid of them? Tom - With a lot of mushroom toxins, you basically get rid of it yourself very quickly. The ones that are less lethal, you're usually sick in hours after eating it. And the ones that are really lethal are the ones like we're discussing here that come on many hours after you've eaten them. In that case, the toxins are very, very difficult to eliminate and part of their toxicity is that they continue to cycle through your system and destroy more cells as they're doing that. So, they're tough to get rid of. I think in this particular case, usually what happens is you'd end up in dialysis very quickly and that can help to eliminate the toxin, but usually, by the time you're doing that, the damage to the kidneys is already extensive. Chris - What about flipping the coin over and asking, well, if these things can have these devastating and dramatic effects in certain target organs, can we use that in some way and come up with some kind of novel therapeutic perhaps for destroying cancers for example? Tom - The one that's best known is the toxin that's in the amanitis, the alpha-aminitin. In that case, it shuts off a key enzyme in your system that allows you to produce protein. So, it's a very, very general target and the only reason that the liver in that case ends up being the main vulnerable organ is it gets recycled into the liver again and again, and concentrated in it. So, it probably wouldn't be useful for cancer treatment, but it's been very useful for research. They've use it to study the process of transcription and making of proteins because it allows you to shut it off. So, it's actually a useful chemical for molecular biology, but probably not medicine per se. Chris - And based on your evolution knowledge, where did fungi get the chemical know-how to make these toxins in the first place? Tom - So, in the case of the alpha-aminitin that I was just talking about, there's been some very recent data on that from genomic sequences of the aminitin mushroom and it looks like the toxin is related to things like spider venoms and so on. So, there are other organisms that make related compounds, but exactly, how the fungi acquired them is not yet clear. 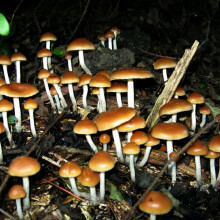 What is clear is that fungi are really good at making lots and lots of diverse chemical compounds and some of these end up being toxins, and very useful to the fungi in some cases where they may kill off a competitor or they may prevent themselves from being eaten by it or something, but fungi in general are just really good chemists. They make lots of different compounds. 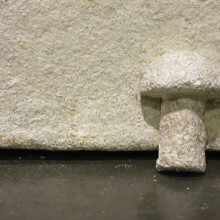 We've heard all about how fungi work in their natural environment but one company, Ecovative Design have worked out how to use mushroom roots in packaging, building insulation and even surfboards. Hannah Critchlow spoke to Ecovative co-founder, Gavin McIntyre. Hannah - So Gavin, plastic foam is used all over the world in packaging and so forth, but why do we need to come up with an alternative? What's the problem with using it? Gavin - Well, the protective packaging foam that's used today which is predominantly made out of expanded polystyrene is a product that has a very short duration in terms of its use. But then when it comes to its disposal, has a life expectancy that'll exceed centuries. So, what we have done is we've generated a drop in replacement with a grown material that is 100% home compostable. It can be put in the backyard and passively return to the Earth. Hannah - And I believe you've used mushrooms to help solve this problem with plastic packaging. Gavin - That's correct because when you look at the ecosystem, mushrooms truly are nature's recyclers. But what we're really interested in is what's known as fungal mycelium which as you called earlier is similar to mushroom roots and this is what we leverage as a natural glue or adhesive in our process. Hannah - We don't usually associate fungi with building materials, so what properties do mushrooms have that make them good for using in this kind of thing? Gavin - The core characteristics that make our material fantastic for the construction industry is that first, they're class A firewalls. You can hit these materials with blowtorch and they really won't burn, unlike foam which will quickly proliferate a fire. They have the same insulation value, better water resistance actually because fungi, their construct is chitin, the same biopolymer you find in crab shells for example. And of course, they're incredibly strong which most of our products today are actually more durable and tougher than traditional plastic foams. Hannah - But how are you then converting this and manufacturing it into the foam? Gavin - So today, all of our raw materials are locally sourced agricultural by-products. Rather than being dependent upon finite resources such as fossil fuels, we source all of our raw materials from within 50 miles of our manufacturing facility. So, we're taking waste streams from farms, things like plant stocks, seed husks and seed hulls, and providing that in our process as a nutrition source for the fungus as well as basically a bulking agent. Hannah - So, why does the fungus actually make this material stick together in this way? Gavin - The way that the adhesion characteristic works with the fungus is that if you were to look at a microscopic scale, a lot of these plant materials do have some pores and the fungus itself in terms of its diameter, because these are small little filaments or fibres, individually known as hyphae, they can penetrate into the little pores of the plant material and actually bind it together. So, it's digesting part of the plant product. While actually, adhering or sticking itself to it and it's very similar to basically finding its way through a little maze and that maze is comprised entirely of farm waste. Hannah - So, you're basically generating this big mushroom fungi farm in your local area. And then how do you kind of make this into the foam? Gavin - We grow these materials to the final shape. We have these small growth enclosures where we mix a concoction of the farm waste and fungal mycelium tissue and it's very similar to concrete. We pour it into the tool and over the period of just 2 to 3 days, the fungal mycelium will grow, digest some of the farm waste, and bind the rest of it together. And the resultant product has the final shape of the original geometry that you want it. And of course, our final process is the drying or inactivation phase where we kill the fungus before it goes out the door. So, by the end of the process, you don't have to worry about it growing again and it's safe for shipment all around the world. Hannah - How do you make sure that the mushrooms are definitely dead because we wouldn't want the mushroom to kind of spring to life again? Gavin - Of course, and that's really critical, not as we ship domestically here in the United States, but as we ship internationally. We put our materials into a drying process that allows us to remove the water initially because this is a wet process, turgor pressure drives growth, similar to that of plants. So, if the materials are too dry, they won't grow. So first, we remove the remaining water and then we hit it with a very high temperature to ensure that the entire cross section of the product is thoroughly dead and we take measurements on petri dishes before our products go out the door to make sure they're no longer viable. Hannah - And then once it's been used as packaging, how long does it take to actually then degrade this material? Are we then left with a problem that it's going to be around on the planet for a very long time? Gavin - The product's final degradation is really dependent upon its environment. The only time the product will break down is if you put it in the soil. It has to be exposed to soil biota. So, other fungi or bacteria that are prevalent and found in the soil, produce the enzymes that are necessary to break down our material. But for example, if you were to leave it in a house, it can well withstand 30 plus years of use. And similarly, if this product were to be placed in the ocean, it will also degrade in about 90 days and that's because the fungus is comprised of chitin and chitin is very prevalent in crustaceans and other organisms that are found within the ocean. 49:15 - Why do I feel sick after exercise? Why do some people vomit and defecate after strenuous exercise? Is there anything that can be done to stop this? David - I'm David Weston, a PhD student in neuroscience at the University of Cambridge. Feeling sick after exercise is something that most of us are pretty familiar with, especially if you exercise as infrequently as I do. But why does our body and our gastrointestinal system re-assert itself after a run around the block? Well, exercise is very physically demanding and your body reacts by increasing blood flow to your muscles and your heart and your lungs, and your brain to keep your body able to process energy and keep your muscles going. This diverts blood away from your visceral organs like your stomach and could deprive your gastrointestinal tract of the oxygen it requires to function. This symptom is called ischemia and is believed to be one of the reasons why you might feel sick after intense or prolonged exercise. Now, ischemia can in very severe cases damage the lining of your stomach and cause the bacteria in your stomach or the toxins that they produce to enter your bloodstream. So, some evidence also suggests that gastrointestinal distress is caused by what you eat and drink before exercise. One study found that foods with higher fat and protein content were linked with nausea and vomiting in triathlon runners. Other studies even suggests that taking aspirin before you exercise could increase your chance of gastrointestinal discomfort. Exercise also increases the levels of hormones released in the brain that control processes like thermoregulation, so your ability to maintain your body temperature. And this drives sweat to the surface of your skin and cools you, but can also result in dehydration. So, a loss of fluid can decrease your blood pressure and could lead to the kind of ischemia that I was talking about before. Hannah - Thanks, David, and poor Ari is not alone in experiencing this phenomena. Jean Kennedy says that she just simply cannot do most forms of floor exercises. She apparently goes green with nausea if she does, whilst a second listener also had this to say on a matter. Ross - Hi. I'm Ross from Birmingham. This is something that I've experienced it in the past and it can be quite uncomfortable. Having sought some medical advice, I found that eating properly, well in advance of exercise and being well hydrated before and during exercise that the problem went away. Hannah - And David agrees with this advice. David - Well, current research suggests that you can reduce the likelihood of nausea and vomiting by ensuring that you don't eat three hours before intense exercise. And also, keeping hydrated is key, so don't forget to drink plenty of water. Previous Meths for Mosquito Bites?